Prima worktops are fantastically engineered laminate worktops that are classically inspired. They’re versatile and can fit into a host of different plans and designs, but whenever it comes to buying or designing a new kitchen there are a lot of different options to be considered. This guide will outline some of the key points to consider in order to help you comfortably make an informed choice when it comes to buying a new worktop. Who are Prima and why are they important? Prima are a supplier of classically inspired laminate worktops of the highest quality. Their motto is ‘laminate in luxury’ and they specialise in granite, stone and marble effect work surfaces. You can guarantee that worktops from Prima will look and feel fantastic no matter what your design. Prima are part of the Bushboard group, premier manufacturers of laminate worktops to suit any budget. Their innovative product ranges focuses on quality and style, while as a company they are determined to be ethical and pioneering in their field. What textures are included in Prima’s range? Crystal: This texture is perfect for those looking to create the stone effect in their kitchen. It works well in darker colours such as black and grey, but can also be effected in more neutral colours. Radiance: True to its name, Radiance can bring almost any kitchen design together. It has a slight matt effect and looks sumptuous when paired with a dark palette. Matte-58: As you can imagine, this is a matte texture that is great to look and touch. Matte finishes look good in so many situations and you can rest assured of the quality of this finish. Etchings: This premium texture is classy and works very well with neutral colours. Those looking for a minimalist kitchen design won’t go far wrong with this texture. Riverwash: Riverwash is as inspired by nature as you would expect, making it a good choice for those looking to incorporate stone or wood designs into their kitchen. What are the most popular textures and why are they popular? Achieve a stunning kitchen design with a beautiful Prima laminate worktop. For the fashion conscious, getting the right texture and staying on trend is important. Currently in the industry there are some established and emerging trends and you can be sure that Prima’s products will be right up to date. One of the current popular designs is to incorporate neutral colours into and design that can be described as minimalist. Whites, greys and shades of cream mixed with stone effects are really selling well, particularly when broken up by bright colours on splashboards. Many kitchens are going back to traditionally-inspired designs though, with natural materials being a central theme. Textures, like Etchings for example, are common with customers who are basing their designs around a stone finish. The word rustic certainly springs to mind and this concept can be achieved in laminate without the hassle and cost of using the natural materials themselves. What sizes are available in Prima worktops? Selecting the right size can be troublesome, particularly if your workspace is not a standard size. Prima worktops come in 1.8m, 3m, 3.6m and 4.1m lengths meaning that you can rest assured you will get the right size for your workspace without worrying about joins showing. When it comes to width they are available in 600mm as standard plus in some cases 650mm. Thickness is often something to consider when making design choices; some people prefer bolder lines when choosing wood or stone effects, whilst others interested in a minimalist look will want slimmer work surfaces for subtler lines. Prima worktops come in three different sizes; the industry standard 40mm as well as thinner 30mm and super sleek 28mm, which is particularly fashionable right now. Rest assured that you’ll have the freedom to get the look that best suits you. Finally, you can choose from a number of different edges for your worktops to really finish off the look of your units. Curved edges rather than squared are currently particularly popular with customers, creating a natural, flowing look, particularly on breakfast bars. 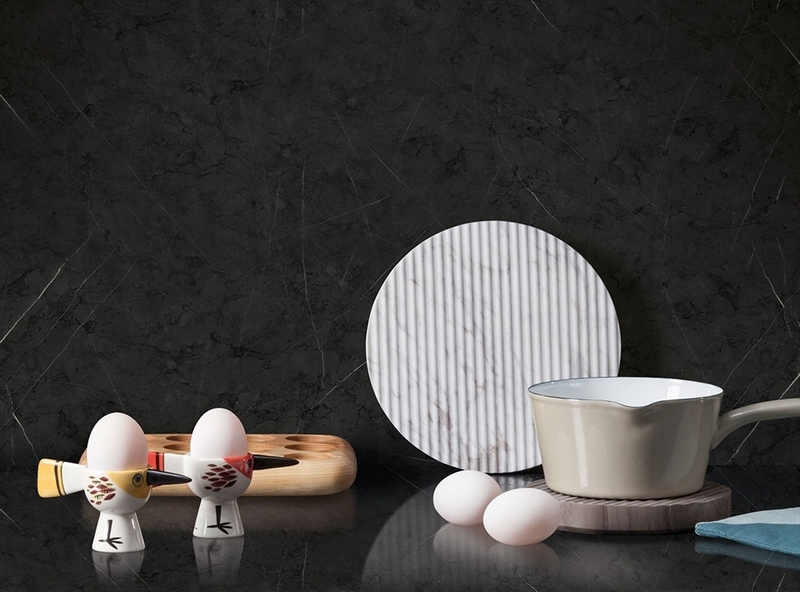 What accessories can you get with your Prima worktop? Once you have made a choice regarding your worktop, you’ll want to think about getting the right accessories to really complete your kitchen design. Prima offer an excellent range of accessories that can be matched to your colour and surfaces choices of your worktop meaning you can create a continuous flow of pattern throughout your chosen style. A splashback can either be used for continuity or for juxtaposition; keep the subtle lines flowing up the wall or go bold with some bright colours to change things up. A breakfast bar is always a smart choice no matter what your kitchen is like. It can make all the difference when making your kitchen a place where the whole family can enjoy spending time, not just at meal times. Upstands can tie together all of your design choices and create the desired ambience. What colours are available with Prima? Colour can be a real sticking point and is often the first consideration to be made when planning out a purchase. Do you go neutral and minimal or natural and strong? Thankfully with Prima’s choice of colours you can get the desired look without too much agonising. Black is a classic choice for a sleek, sophisticated kitchen. or natural wood, which can all be matched to designs featuring wood or stone textures. Those looking for a neutral look will prefer such colours as grey, white or cream that give a more muted tone that is often complemented by thinner worktops and can be set off by using a brighter colour on a splashback. Keep in mind the colour of your kitchen cabinets and try to go for colours that match or compliment them and you’ll be making a smart design choice that is in vogue currently. Get your colour and lighting right and you’ll have a room in which people will delight in spending time in. What are the benefits of choosing a Prima worktop? Prima and Bushboard support the Made in Britain campaign, manufacturing their products in Wellingborough, Northamptonshire. As a mark of their quality and excellent standards, the Furniture Industry Research Association awarded Prima their Gold Certificate. Their quality speaks for itself. With a host of options available when it comes to textures, thickness and colours, you can be sure that no matter what you imagine for your perfect kitchen, Prima can deliver. As a company that is conscious about the environment, all Prima chipboard is manufactured to the PEFC standard, meaning that materials come from sustainable resources that are responsibly managed. All of Prima’s laminate worktops use Sanitized Actifresh technology, an anti-bacterial protection that is odour-free and non-toxic and reduces microbe growth and bacteria by 99%. Now you’ve found out more about colours, textures and sizes, why not browse our full range of Prima worktops now?